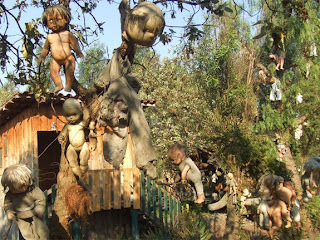 Information:Popular television show Destination Truth, decided to take an adventure to the ancient canals south of Mexico city that supposedly is home to an island of reportedly haunted dolls. 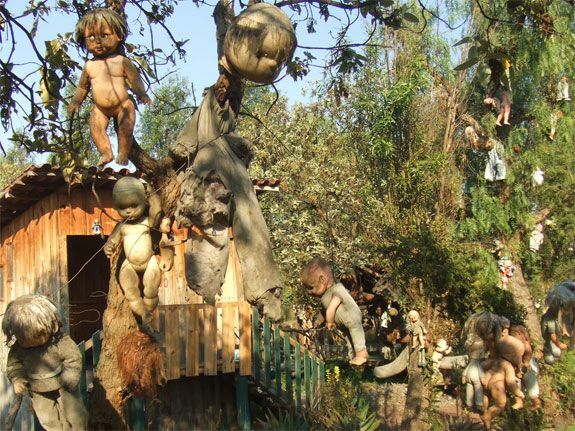 The previous caretaker of the island allegedly strung up the dolls in an attempt to ward off evil spirits of a young girl who allegedly drowned there. 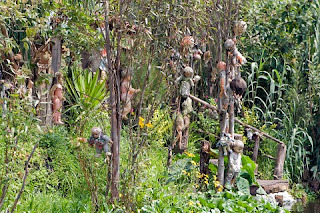 The claims that the natives have about the island is that the dolls themselves have taken on the girl's evil spirit and have been seen whispering to themselves and summoning those whose passing by to come to them. The caretaker of the island, Don Julian, was recently found dead in the visiting canal where the girl also drowned and now his spirit is said to also haunt the island. 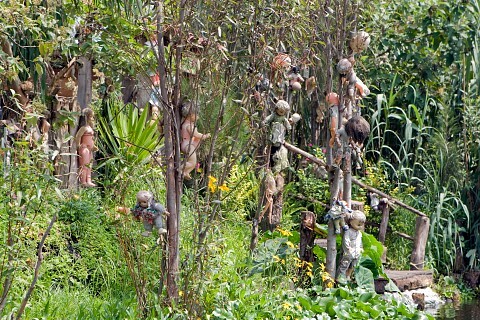 Natives assumptions about the island vary, however, anyone who visits the island must bring a doll as an offering. The doll's spirit are said to connect with one another. Josh and the rest of the Destination Truth crew place their offering of a doll and a candy bar near the water's edge in the episode. In the episode several minutes later the "spirits" are said to take the bait and something causes a mysterious ripple in the water. Throughout their adventures to the island Josh and his team find high reading on EMF detectors, definite voices answering questions, figures of a person;s body, and the unexpected eyes of a doll opening. According to the Destination Truth team their experiences on the island indicate a strong point of view that the island indeed does hold paranormal activity. Concrete evidence such as the voice recordings, imagery picked up on the thermal camera and Mike's eerie encounter all point to signs of paranormal activity on the mysterious haunted doll island. The question at issue is if the island is truly haunted by paranormal activity of the young girl who is said to have drowned and lurks the island with her negative evil spirit? The video below shows Josh and his unusual and startling experience with one of the dolls on the island. Nice post. I watched this episode, pretty crazy stuff. there was an episode of the The River that had something very similar to this, it was creepy.